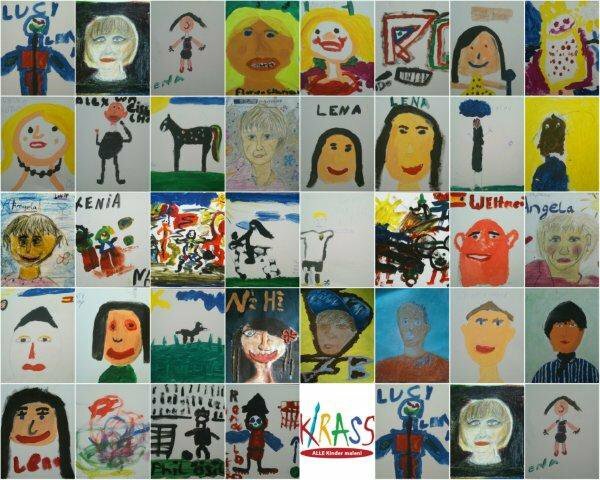 Art meets German course - KRASS e.V. The project “Fit for class” is aimed at children from different nations and cultures. Subjects are prepared in consultation with the teacher and his/her German language skills. A combination of language and design work should take up well-known vocabulary, consolidate and promote a good conversation culture. In regular and shared reflection, children have the opportunity to evaluate and praise each other’s work. The main focus here is the appreciation culture. A constant change of individual, partner and group work enables the children to carry out their own interests in their work, but also to develop them further in exchange with others. Attention is paid to the fact that children of all ages work together. With this project, children of the international class will have the opportunity to develop their social skills in the encounter with different cultures. This is to be done by learning in a joint creative work, creatively implementing ideas together and working together towards an artistic goal. In addition, the project is intended to consolidate the relationship levels, thereby strengthening their self-awareness and self-esteem. By eliminating school pressure through grades, they experience a work that is focused on them alone. It is not the goal of a finished work that is primarily the focus, but the artistic path to it. Especially in international classes, this experience is important in order to cope with the many requirements that will be experienced during their integration into a foreign education system. It is therefore both the body’s own image and the individuality that is the focus of this work, which should be strengthened and enthusiasm should be awakened / lived.